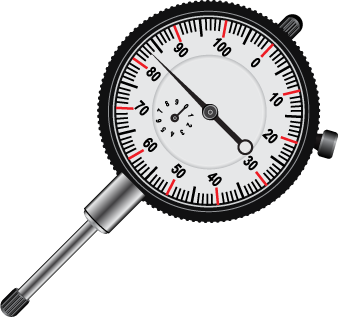 Crankshaft end play is measured with a dial indicator mounted on the engine, and the indicator tip on the crankshaft flange. Use a pry bar or a large screwdriver to move the crankshaft back and forth. Compare the results to manufacturer’s specifications. They should be minimal, a few thousandths at the most. Keep the main bearing caps in order during crankshaft removal. Most main bearing caps are marked with a number and directional arrow. Make sure they‘re present and if not, make your own. 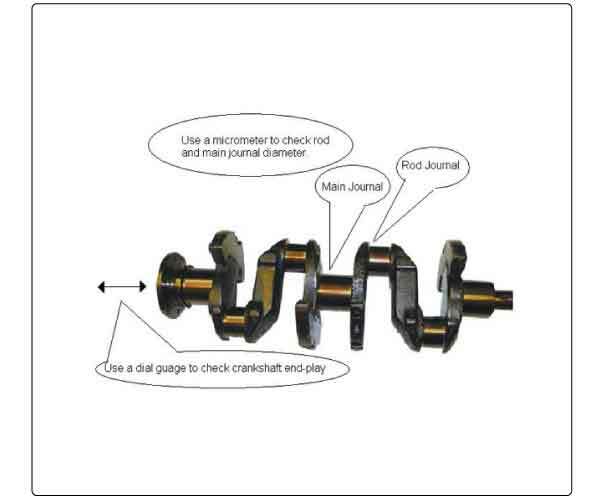 An outside micrometer is used to check for crankshaft journal wear. Check both around and along the journals for taper and out of round. Journals wear at the ends or in the middle. Check for roundness at two or more different points, they usually wear at one place, (TDC) top dead center. Make sure the oil passage holes in the block line up with the oil holes in the bearing. If the block or journal have been machined, the job may require oversized bearings. Check the clearances with plastigage™. Insert the plastigage in the center of the bearing and then properly torque the cap. Measure the thickness against the gauge on the package. If there’s a sharp rapping noise, especially at idle, the crankshaft should be inspected and checked for crankshaft end-play. In most cases this can be achieved by mounting a dial indicator on the timing cover and placing the tip of the gauge on the harmonic balancer.